Faezahs | 96's. An undergraduated student of University Malaysian Terengganu. Degree in Software Engineering. Studyblr & coffee of course & make up too. FH'phile 💕. Hi, malam ni faeza ada masa free sikit so faeza nak buat tutorial " how to add comment on blogskin "
Just follow these below steps ya. 1. Search code belows in your theme codes . 2. Copy codes below & paste below those codes. 3. To change with your own font & colour . pink , the font color for the comments word. blue , the font size for the comments word. red , the font family. yellow , the comments word. 4. Thats all. Good Luck! Pernah tengok tak kat every end post ada signature?? Tak pernah ?? Tengok gambar kat bawah . Hah! Lawakan . So, mari faeza ajar . 2. Click button start now! Yang kat bawa burung biru tu :)! 3. Choose Using the signature creation wizard. 4. Enter your name > click button next step > select the font that you want > click button next step again > select the size for the signature > click button next step again. 5. Select the colour for the background and the font . For the background colour, kalau uols nak transparent kan background just click the small box beside the transparent . Kalau nak bagi colour pun boleh . For the font colour, pilih ja la warna yang uols nak . 6. Click button next step again > set the slope > click button next step again. 7. 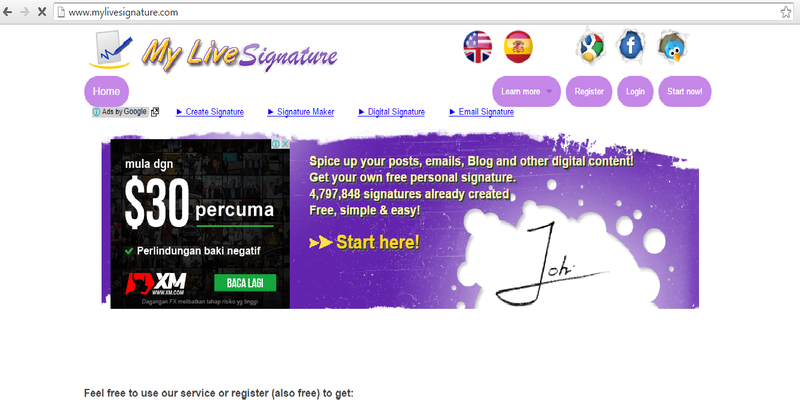 Scroll bawah sikit & click Want to use this signature > choose the Generate HTML code . 8. Lepas tu , kat Generate HTML code tu ada dua pilihan . 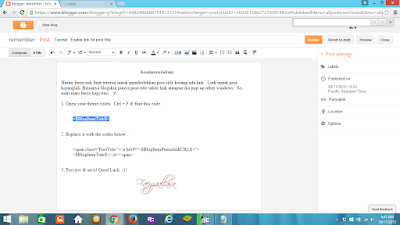 Pilih yang first " Generate the code for my handwritten signature " . The second one tu faeza tak seberapa tahu sbb faeza taknak ambil tahu pun ;-)! 9. Dan uols akan nampak code signature yang korang dah buat . Copy the code . see, setting yang kat bawah ni click! 11. After click setting > post and comments . 12. Kat laman post , korang akan nampak satu box - post template . 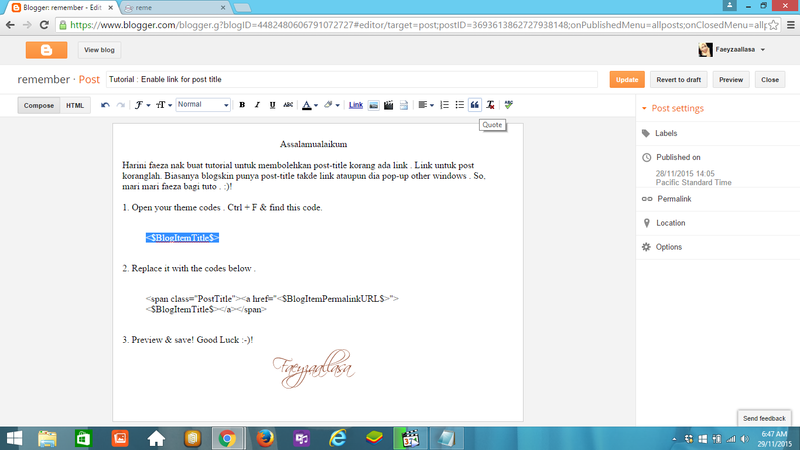 Paste code yang korang dah copy dari livesignature.com tadi . 13. Don't forget to save! Yeayyy, you're done with your own signature at every end of your post. Almost blogger already know how to use the blockquote . Only certain people like me don't know how to use the blockquote until I find the tutorial . 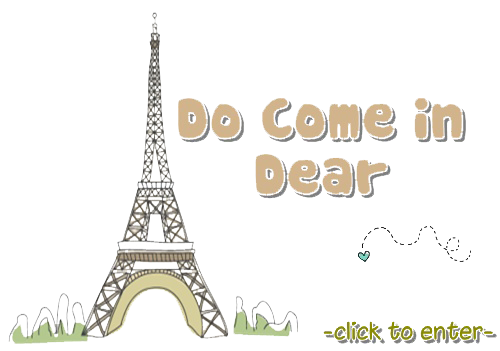 And I want to share with you all :-) ! Take a look . It's really easy . 1. Make sure your theme codes or blogskin already have a blockquote codes . 2. Highlight the sentences / words that you want to blockquote. Like this! 3. After you highlight your sentences, click the button quote. See the picture below! Make sure the words still in highlighter . 4. You're done! Easy right :-) !